4/5 Stars "Overall, I like the book, I think it makes for an excellent training program, and it will undoubtedly become established as a valuable tool for players who are serious about improving their game." "There are of course many ways to improve the skill in chess, and that is what every chess player wants at every level. But the method of the Swedish master Hans Tikkanen is very original. 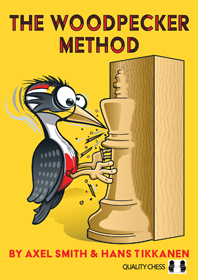 His colleague Axel Smith coined the name: The Woodpecker Method, published by the Scottish publisher Quality Chess, where so many interesting books come from."